East Bay Paratransit is a public transit service for people who are unable to use regular buses or trains, like those operated by AC Transit and BART, because of a disability or a disabling health condition. East Bay Paratransit transports riders from their origin to their destination in vans equipped with a wheelchair lift. 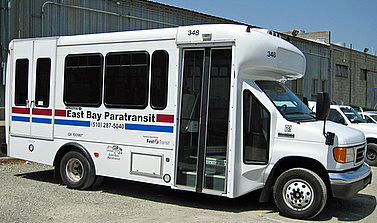 East Bay Paratransit was established by AC Transit and BART to meet requirements of the Americans with Disabilities Act (ADA). AC Transit and BART, who operate East Bay Paratransit (EBP), are committed to ensuring no person is excluded from participation in, or denied the benefits of its services on the basis of race, color or national origin as protected by Title VI. If you believe you have been subjected to discrimination by East Bay Paratransit under Title VI, you may file a written complaint or call the paratransit offices. Title VI complaints should be filed as close to the date of the alleged discrimination as possible, but no later than 180 days. Title VI Complaint forms are available here. You may also obtain a complaint form or file your complaint over the phone by dialing East Bay Paratransit’s Customer Services Manager at 510-446-2006 or dial 711 for the California Relay Service. East Bay Paratransit is fully compliant with the paratransit requirements of the ADA. We are committed to making reasonable modifications to policies, practices and procedures to ensure East Bay Paratransit services are accessible to everyone. To make a request for a reasonable modification, please contact East Bay Paratransit’s Customer Services Manager at 510-446-2006 or dial 711 for the California Relay Service or download the Reasonable Modification Request form here. 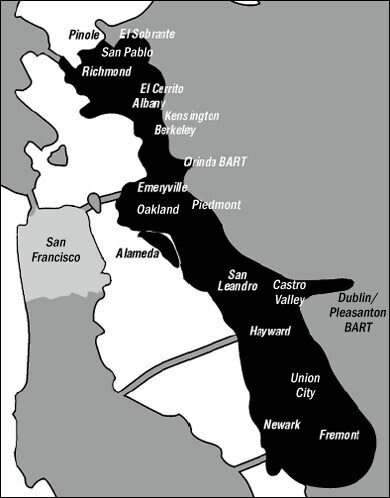 Where can I ride on East Bay Paratransit? You can also go to and from any of these cities to anywhere in San Francisco. You can go elsewhere in the Bay Area by taking East Bay Paratransit part of the way and then transferring to another ADA paratransit service. Service is provided during the hours of AC Transit’s bus and BART’s rail operations. Service is limited to areas within ¾ mile of an operating bus route or BART station. Call (510) 287-5000 for information about specific times and locations.